The STREAMITY project is focused on creatinga powerful cryptocurrency exchange that includes a broad range of services. The goal is to ensure users can benefit from the developments in the cryptocurrency market, while mitigating risks arising from cryptocurrency ownership, transfer, and exchange. 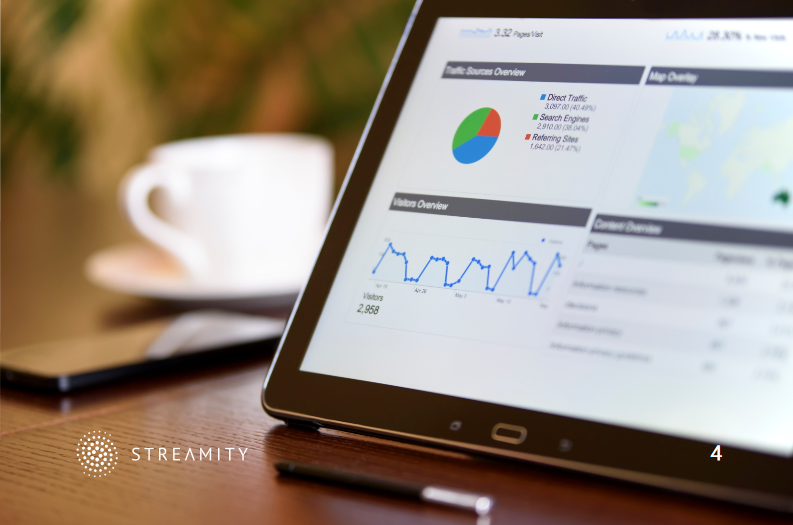 The key element of the STREAMITY project is the STREAMDESK aggregator. 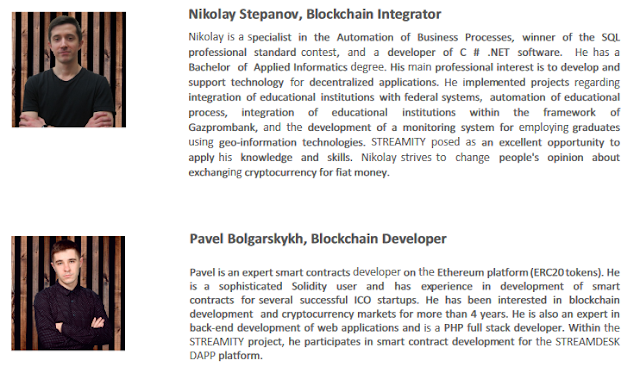 STREAMDESK ensures exchange of cryptocurrencies for fiat currencies using smart contracts. The STREAMDESK prototype is available online and represents our core concept. 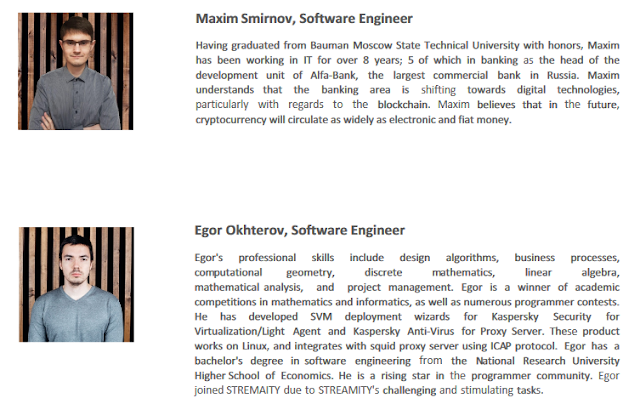 STREAMDESKwill ensure the most secure and efficient exchangeof cryptocurrenciesby aggregating market capitalization and price data from major cryptocurrency exchanges. Thus, cryptocurrency rateswill always be bound to its true market rate, and forprofit manipulation of exchange rateswillbe impossible. All fees are known in advance and will be transparent. 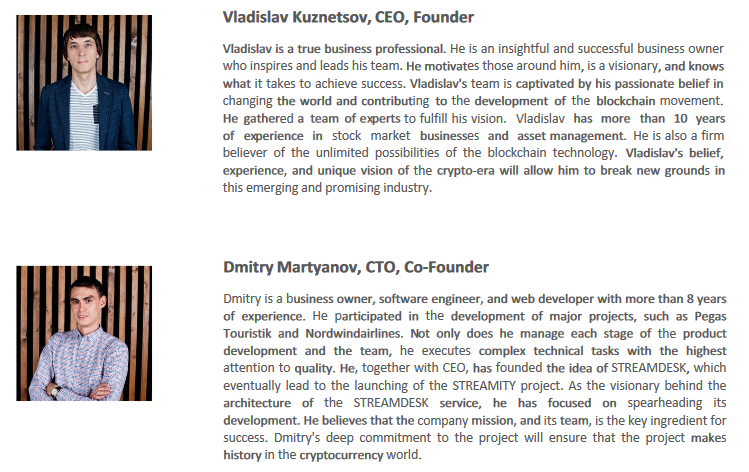 STREAMDESK provides significant advantages to investorsand users. Therewill be a clear display of relevant market data and its fees, coupled with afair,transparent, and secureexchange . 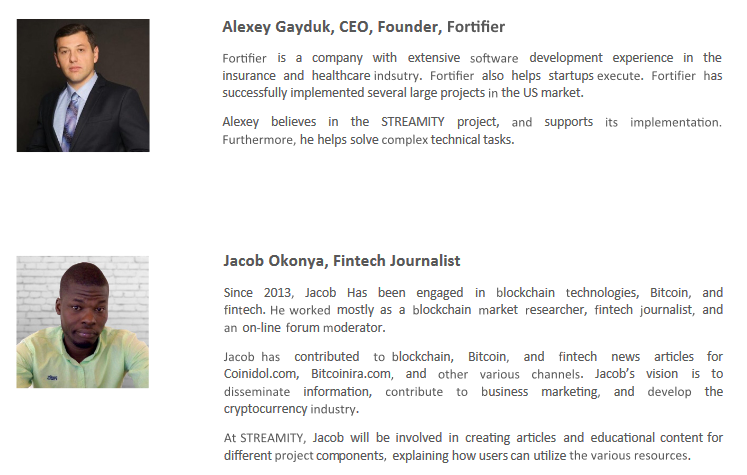 Furthermore the STREAMITY service will include news,analysis, educational, and investment resources. 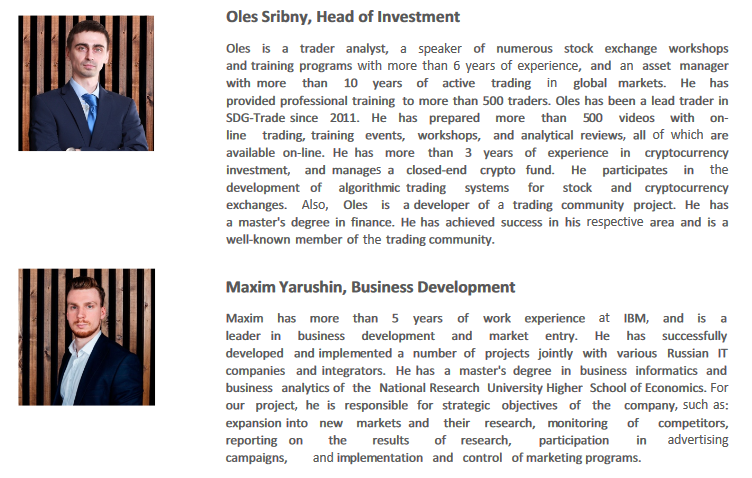 All the aforementioned services will provide value-added assistance to investors with regard totheir management and accumulation of cryptocurrency funds. Each STREAMITYservice will represent an independent business environment and will generateincome from itsvarious digital services. Our priority are our users. 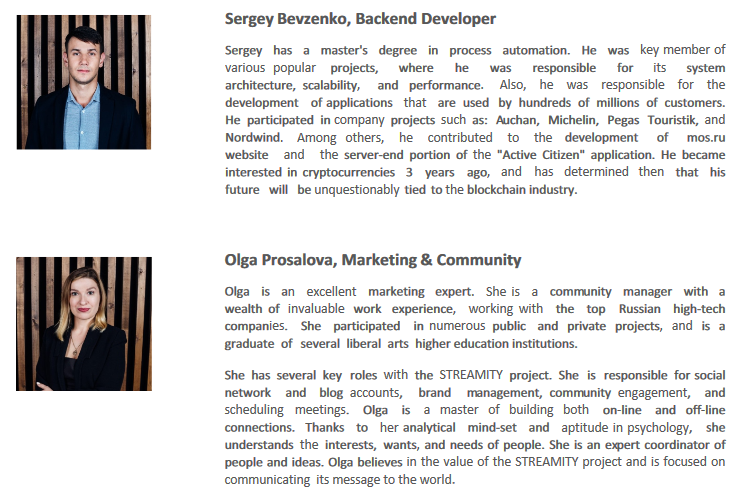 Our mission is to contribute to the development of the cryptocurrency community'ssecurity. 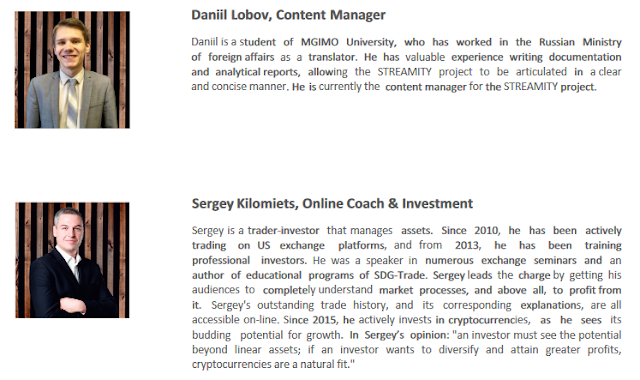 We will develop a fair and transparent STREAMDESK service that allows for the exchange of cryptocurrencies for fiat currencies without intermediaries. Thiswill help users save money, and will protect them against fraud through the use of smart contracts. According to CoinMarketCap, the average daily trading volume of cryptocurrency in September 2017 exceeded $4 billion(USD). Furthermore the market capitalization of cryptocurrencies exceeded$130 billion (USD). However, the cryptocurrency market is small compared to the global trade of fiat currencies. For example, the Bank of International Settlements assessed the daily trading volume of the global FOREX market at $5.1 trillion (USD). By extrapolatingthe cryptocurrency market's current growth rate,the cryptocurrency market may achieve similar volumes as the FOREX market within 3 years. Therefore, we may soon live in a new reality where the cryptocurrency exchange market will dominateover global fiat markets. 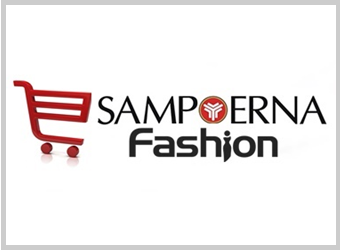 increase in its growth and development. (DAPP): a P2P cryptocurrency exchange platform. to users' accounts after the second stage of the ICO. 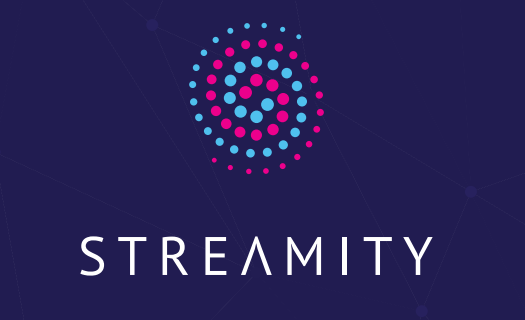 All unsold tokens will remain in reserve with STREAMITY's project founders. 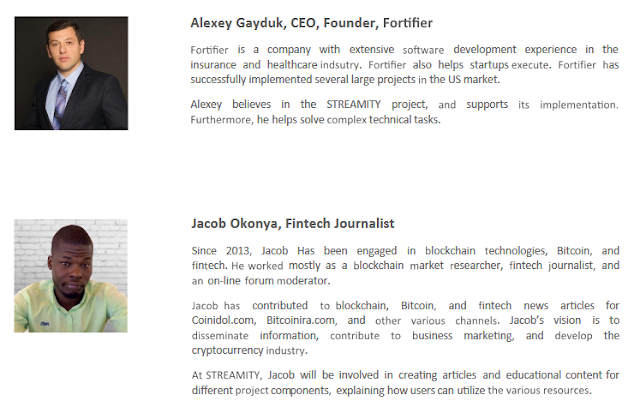 40% of the STREAMITY team's share will be held in reserve. This will be used sustain the development of STREAMDESK service and maintain liquidity within the system. 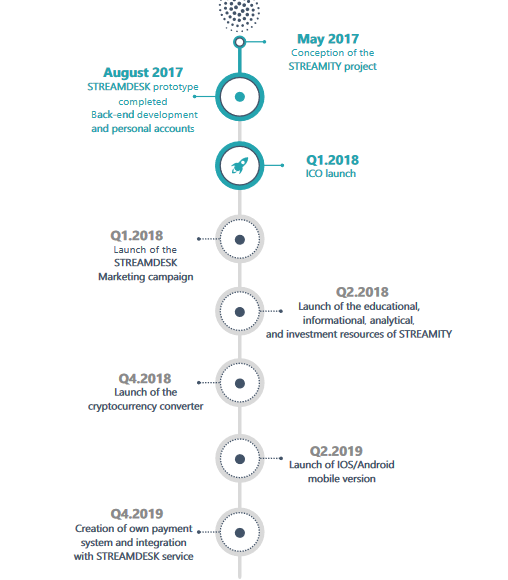 50% of the STREAMITY team's share will be held for one year,as stipulatedby the conditions of smart-contracts. Also this share will be held until the launch of the STREAMDESK mobile applicati. 10% of the STREAMITY team's share will be paid to staff as gratuitiesfor the ir accomplished work. Shares for STREAMITY'sadvisors and partners will be held for one year, as stipulated by the conditions of smart-contracts.